Essay Have offers competitive prices and are willing to take a go at just about any project you have for them. They do this by hiring a large pool of writers, some of whom are over qualified and some who are under qualified. Due to their huge number of writers, you can be pretty sure Essayhave will agree to take on just about any paper you need written. If you have an essay assignment, you can submit it to Essay Have and they’ll do it, even when the others won’t. They work at a variety of academic levels, all the way up to Ph.D. work. The site offers such a huge number of services that it’s impossible to list them all. Some of the most popular are book reports, book reviews, thesis papers, presentations, research papers, case studies, general essays, admission essays, term papers, resumes, bibliographies, speeches, reaction papers and more. 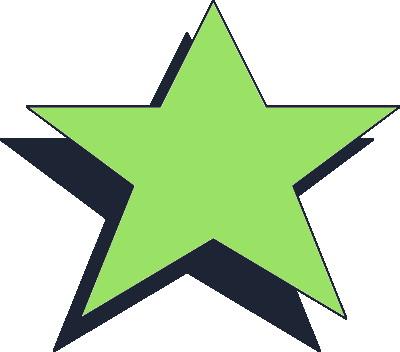 Because the site isn’t as popular as some of the other paper writing services out there, you won’t have trouble finding a writer who is available to complete your assignment for you. This might well be a case of jack of all trades, master of none. The basic high school paper starts at $10 per page. The cost goes up as you progress through the different levels of college and cost more if you need the paper faster. If you need a paper within 48 hours for a graduate level class, you’re looking at paying closer to $50 per page. The cost changes based on the number of pages you order as well. The site offers free revisions on their papers, as well as a free title page and bibliography. If you’re unhappy with the finished product, you can take advantage of a money back guarantee. The site also offers lifetime discounts once you spend a certain amount. For example, once you spend $500 on the site, you get 5 percent off all future papers for life. You can’t access the discount codes unless you sign up for the service through the EssayHave.com website. We ordered a short paper from writingservice. EssayHave.com with a deadline of 48 hours. While we did get the paper back on time, it wasn’t free of mistakes and we had to go through a couple rounds of revisions for it to be completed to a satisfactory standard. Overall, the paper was decent, but the writer probably didn’t know the material as well as one could be expected from the Essay Have testimonials. When we had a professional editor look at the paper, several formatting and grammatical mistakes were discovered. There are several ways to contact the site, including traditional mail, email and live chat. However, the company has a physical address that allows you to send mail, but the company isn’t registered there. The site claims to offer live chat, but it’s not always available. You’ll also have to wait for a response when you email or call Essay Have as agents aren’t really there 24 hours a day like the website says they are. However, once you get in touch with an actual person, you will get a straight answer to your questions and the help that you need fixing problems. 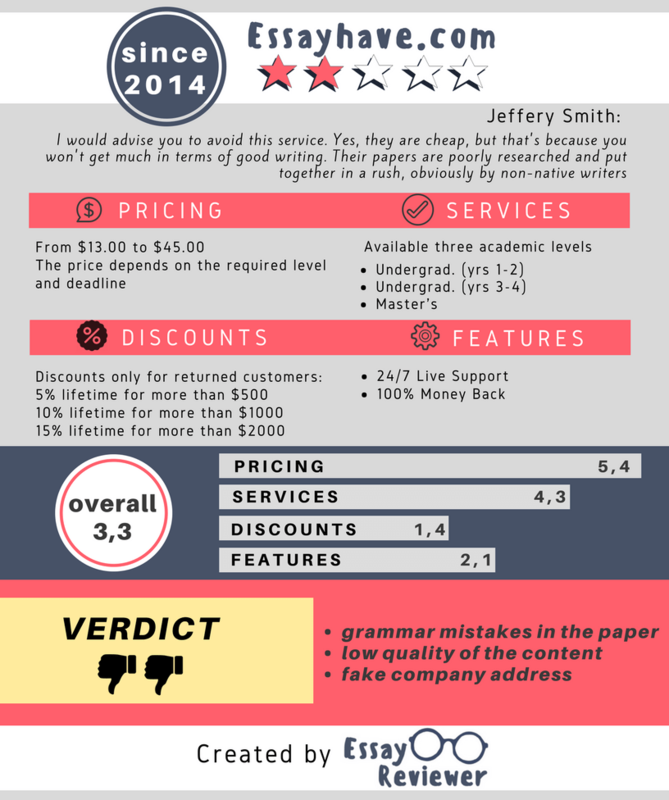 If you just need a cheap paper, fast, Essayhave are legit and could deliver what you want and need. However, if you want something a bit more researched from an expert in the subject of your assignment, you’ll probably want to seek help from elsewhere. I’ll be honest: I chose this paper writing service for the prices. They are pretty affordable and I believed that I could get a decent paper for that money. Let me tell you about the essay I got: it was too basic. I mean I specified that I was a college student and I needed an appropriate quality, but the essay I received wasn’t college-worthy. I thought that essay was perfect for a high school student, but not for me. Not what I expected.